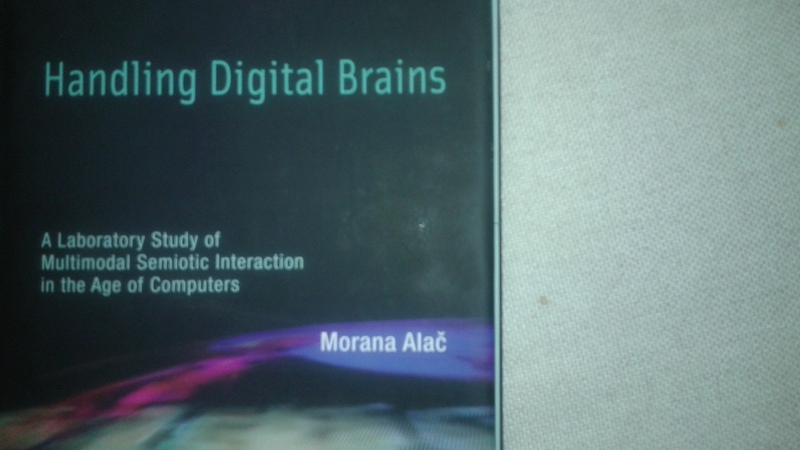 Back in 2011, MIT Press published Morena Alač’s Handling Digital Brains: A Laboratory Study of Multimodal Semiotic Interaction in the Age of Computers. I know it’s a late pass but I’m here to add a review to Cosmoso.net. Brain science is one of those exciting fields that is still being developed. Neurostudies still have several cutting edges and I didn’t get a chance to read this amazing book until 2+ years after it was published. One of the exciting principles of developing new and better technology has to do with understanding how we as humans interact with available and burgeoning tech. The interface between various technologies and human users has traditionally been a physical one, requiring us to use our eyes, ears and hands – our senses of sight, hearing and touch. This is because the mind has traditionally been conceptualized as a tangible thing residing in a physical organ inside the skull, the brain. Fresher, more current re-conceptualizations of the mind have recast consciousness as a state of being, rather than the brain itself. By this view, we are not our brains; human minds are the state of decision making that occurs within the brain. It’s a difficult distinction that can exclude the layman, and indeed even the educated philosopher, psychologist, or tech developer from the conversation happening in neuroscience and artificial intelligence academia. Morana Alač articulated embodiment, a burgeoning concept in an ongoing conversation about human meaning, making and socialization. Handling Digital Brains examines a team of neuroscientists in an fMRI (functional magnetic resonance imaging) laboratory. The scientists are manipulating brain-imaging data using an interface that allows and even depends on the entire body to be engaged. This book is a must read for anyone interested in the future of information technology, programming, imaging, and progressive machine/human interface technologies.